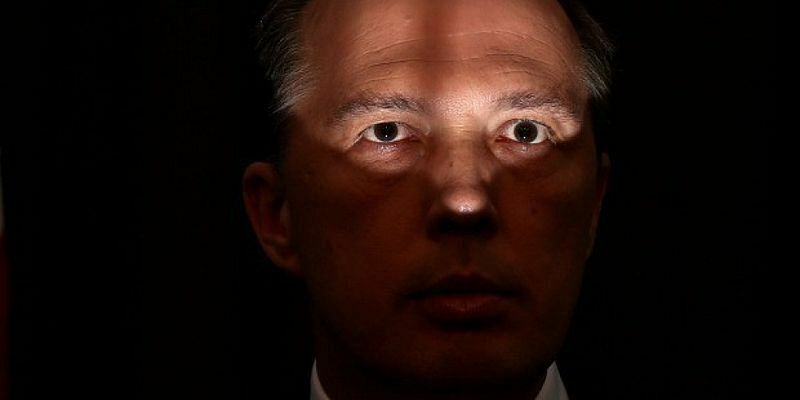 Peter Dutton encased in shadows (image by Domrafferty via Wikimedia). Although Australia isn't irredeemably plagued by corruption, we all must remain vigilant to ensure a healthy democracy, John Haly reports. The media and public’s desire for a federal anti-corruption body and the search for transparency has met with a lagging response by the Government. From the mantra of “on water matters” when resisting transparency around refugee issues to the failure to submit Peter Dutton to the High Court over his extraordinary profiting from the public purse, the lack of transparency is wearing thin with the public. As media scrutiny digs deep into the hidden recesses of the largess to Ministers provided by Government coffers, the public is finding their protests about the “double dipping” of mothers or the “lifters and leaners” or the justification of “robo debt” claims a tad hypocritical. The years of the Government shielding the banks from the scrutiny of what the Financial Services Royal Commission has revealed, while these same banks donated millions over time to their political coffers, has upset the public, especially as they have often been the victims of these banking scams. That successive prime ministers wanted to offer millions in tax welfare to the banks as a gratuitous icing on the cake above and beyond protecting them from their crimes, was seen as very “rich”. That Prime Minister Scott Morrison could claim that he was unaware of the long history of banking fraud and money laundering or saw it as nothing more than a “populist whinge” flies in the face of what banks have been seen to do here and across the globe. Repeated inquiries into the banks from the Wallis Inquiry in 1997 to the Murray Inquiry in 2015 and the equally numerous scandals during this century, from NAB concealing losses in 2004 to CommInsure payments scandal in 2016, have demonstrated clearly that unregulated banks will always misbehave. There were never any legitimate grounds for not having a Royal Commission, but the Government resistance was palpable. As with most cases of corruption and graft to be found in Banks, isn’t it always recommended that one “follow the money”? On the international scale, one has only to look at the Danish banks in a country routinely near the top of the Transparency International Index. As the Danish Government hosted the International Anti-Corruption Conference (IACC) in Copenhagen on the 22nd of October 2018, the scandal of the Danske Bank was prevalent in the media. The national Danish Chair of Transparency International, Natascha Felix, welcomed the collective audience to three days of workshops and discussion groups. She spoke specifically of the failure of control systems that “allows individuals to steal from the most vulnerable populations in Denmark” and how a Danish bank laundered millions of dollars. One of Natascha’s important opening points was that “when it comes to corruption there is so much more at play than rules and regulations and procedures”. For example, locking people in German gulags in the mid-1940s was legal, whereas smuggling Jewish people out of Germany was illegal. In a contemporary example, locking up asylum seekers – who have no criminal charges laid against them – in gulags has been legal for years in Australia. Current illegalities have echoes of the German past. When even so much as reporting crimes committed against “legally innocent people” while working in these gulags is illegal, the roles of values and ethics that transcend laws of convenience are significant. Corruption and oppression championed by poorly drafted laws and regulations does not make the actions of governments less morally egregious. Natascha Felix presenting at the International Anti-Corruption Conference (Image by John Haly). Australia held the enviable position of being seventh in the world in the Transparency Index in 2013, but since the Coalition Government has been in power, we have dropped to 13th. This is still an good position, especially after I was confronted by a response about that fall, by the former Syrian Minister, Abdullah Al Dardari. While on a panel in a workshop at the IACC conference, he gave an amused response to my query about how Australia should proceed. “I will take Australia at any time now … this is a different planet, what you are talking about … 13th, [we’ve] never been 150th”. While many in the audience laughed, context on the international scale can be quite sobering (just in case you were curious, Syria comes at 178th, so you can see why the ex-Minister suggested my concerns were “from another planet”). Still, we are not without our battles to seek better from our governments regarding transparency and the absence of corruption. As Denmark and our own experience demonstrate, being amongst the top end of the Transparency Index doesn’t mean our governments and banks and institutions will not make every effort to “rob you blind” and quite literally, “rob the dead”. Corruption still persists in robust democracies with independent judicial and media oversight. Were we in Syria, it is unlikely we would even hear of banking scandals, much less have any official inquiries. Nor might we have heard that Peter Dutton made $5.63 million from direct subsidisation of his childcare facilities for which he voted. Perhaps it didn’t occur to him there was a conflict of interest? I am stopping here, although I am sure dear reader you can find many more. Whereas attempts to pork-barrel electorates — whether it be Barnaby Joyce or a Wentworth By-Election will always receive high publicity under any regime as long as it was positive and complimentary. Negative stories like Joyce’s condemnation of women to cervical cancer deaths would, of course, be wholly suppressed where less robust protections for journalists exist. Former Syrian Minister Abdullah Al Dardari speaking at the International Anti-Corruption Conference (Image by John Haly). Corruption is multifaceted and has high-level impacts for any country and even if we are not the worst, we are infected by its influence. So, we are not Syria. We do publicly react to, and have legal stoushes over, the apparent corrupt conduct of our political leaders, banks and institutions. And with respect to Abdullah Al Dardari’s entirely appropriate observation that we in Australia are “on a different planet” compared to what he has had to battle in his roles in Syria and later the United Nations, it is a fight none of us should relinquish because there are darker shades of grey. For a long time, we’ve remained politically disengaged, proud of apolitical inclinations, unwilling to take stand over the dinner table on behalf of the struggle of others, lest we offend our privileged white neighbours. We have paid scant attention to the slippage that once it gains momentum, will career downwards unless we put our backs against our pedestal and push hard. Three countries slipped in the Global Corruption Index becoming more corrupt; Libya, Brazil and Australia!!! This article was originally published at Australia Awaken on 30 November 2018 under the title 'Comparative Corruption and Transparency' and has been republished with permission. You can follow John Haly on Twitter @halyucinations or on his blog at auswakeup.info. It's time to make a change. Subscribe to IA.